The mysterious process of virtual color, online color, e-design, whatever you want to call it, is very complicated and not every one is proficient enough to design this way. I know because I’ve been tweaking virtual color consultations for years and finally have the process down to a science. Today, I want to show you how it’s done. Before I start I will tell you that because this design is from an actual client that I’m currently working on, I can’t reveal any of the color names. My current client is from the shores of Oak Island, North Carolina and this home doesn’t exist yet. It will be built in a new months but for now, we are getting the color all set up before the first 2×4 is up. Today, I am going over some of the steps of a virtual color consultation so you can visually see how this process works. I will list a few steps, in no particular order because they are all important. What is THEE most important element that I need in order to have a successful virtual color consultation? 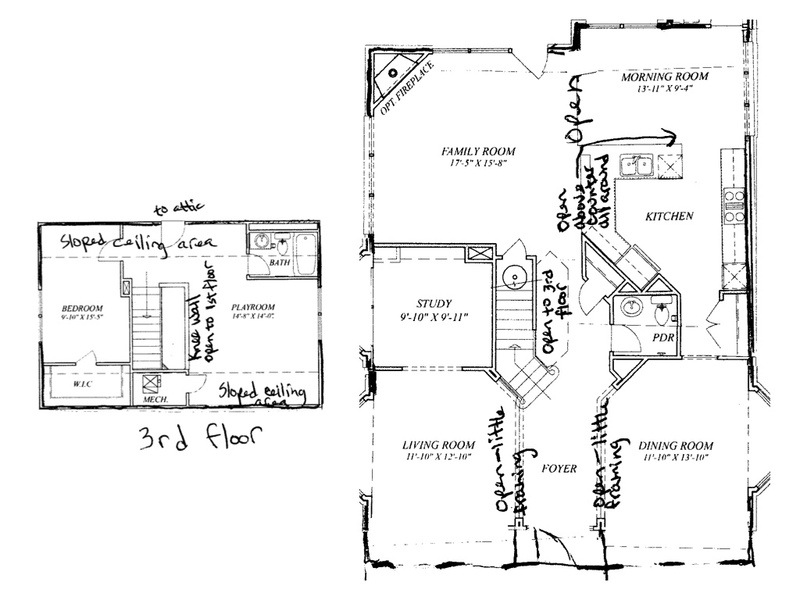 Can I design without a floor plan? 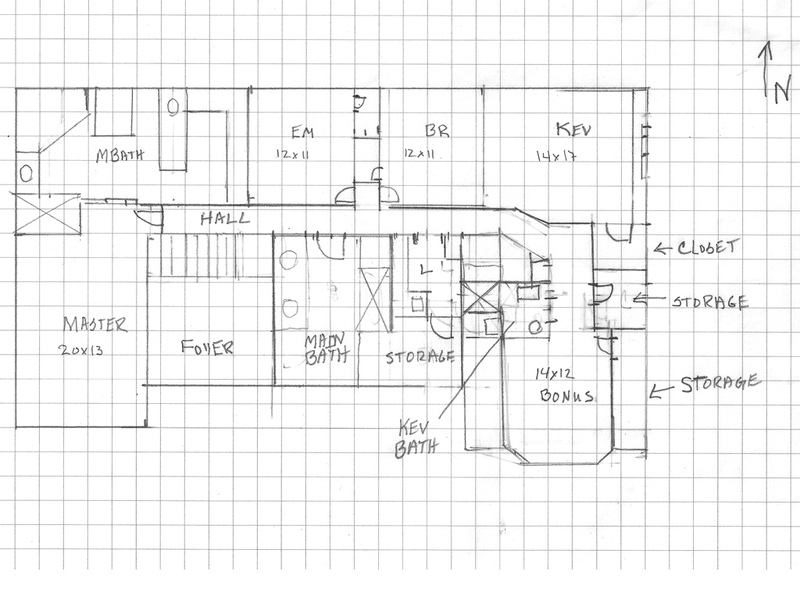 Of course I can and I’ve done it a thousand times before but having a floor plan will cut the design time in half. Does it have to be a professional floor plan like this one? No. It can be a basic, hand-drawn sketch on paper and I’m talking Fred Flintstone basic but I really do require one for best results. So you can see, I’ve worked with just about every floor plan possible so if doesn’t have to be professionally designed just provide me with a basic layout. Of course the more detail you provide, the better but that isn’t always necessary. My favorite type of floor plans are the ones you find on real estate websites if you just bought a home, perfect! Go to the website and grab that floor plan. Now this step is more important than having floor plans. I have to have pictures of the rooms in your home that you need color for, be it one room, two rooms or the entire home. Now this can get tricky. In this case, the home is not built yet so how do I get pictures to visually see a home if it’s not there yet? give you the wrong color layout because I can’t see your space. None of these are good scenarios so just use your iPhone, iPad or Nikon to provide me with the best snaps you can, preferably wide angle. Close-up pictures of countertops, flooring and tiles are also very important to have. Here is an example of some of one of the pictures I have for this Oak Island project, again, because it isn’t built yet, the client doesn’t have any pictures but does have this computer generated graphic. Now this is where it gets complicated. The client only has two graphics for the home, this one and another one from a different angle. What about the rest of the home? How do I see that if it’s not there yet? This is where the floor plan comes in. 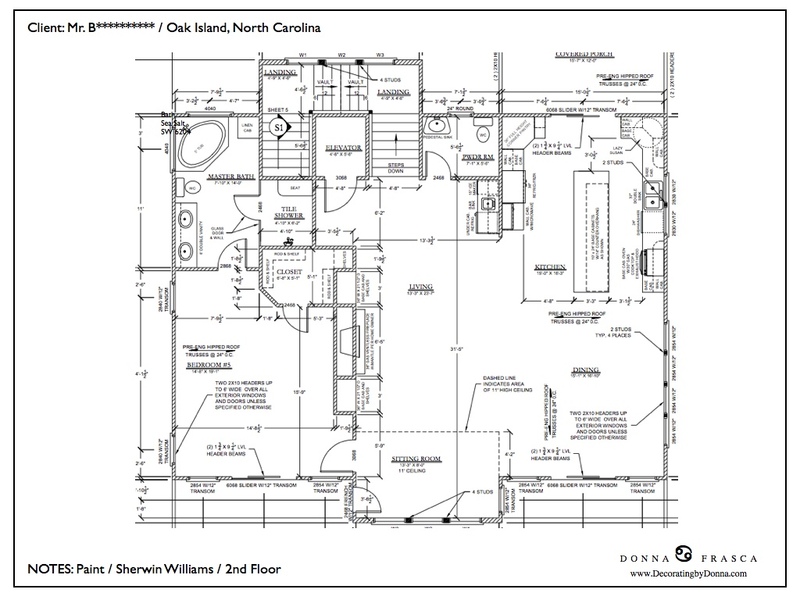 The professionally drawn floor plan belongs to this client. Since I have the floor plan, know where he lives, know that he wants a coastal color scheme (yes that’s my favorite to design) and have spoken to him on the phone, I have a really, really good idea of what he wants. However, and this brings me to step 3. Pinterest is my friend. I don’t have to explain what Pinterest is to you but there are a few of my clients who are not computer savvy and this step is not possible. Therefore, they send pictures via email or a word document all of which are fine. I work with the comfort zone of the client which is highly, highly important. You certainly don’t want your virtual clients feeling frustrated, rushed or inadequate about this process. This Oak Island client has a great Pinterest board. He provided pictures of rooms that he likes. Many pictures were pinned from HOUZZ and in the comment section he would note: “I really like the look and color of this room” or “the blue in this kitchen is the feel that I’d like in my kitchen.” Descriptions are highly, highly important. The more you describe what you want, the better visual I get for your space. SECRET boards are also extremely helpful. If you use SECRET boards, I can then pin all the colors right there in Pinterest which is really easy for you to see. If you don’t have Pinterest then I send these graphics via email, one at a time, which works fine as well. These are the colors that are in the works for this project and again, the paint names are left out but you can see how the colors will flow. 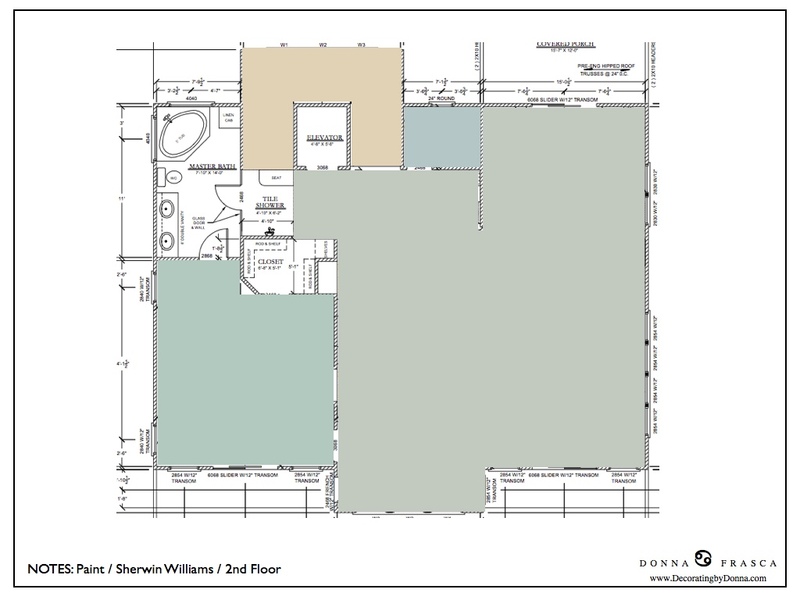 See why floor plans are so important? Ok, I’ve given you a lot of information here but it’s really the bread and butter of how these virtual designs work. Every virtual client is treated as an individual case and I work based on what that client needs. Sometimes they are elderly and would like to move slowly and just have one color at a time. Sometimes the clients are a newly married couple and just bought their first home and want it all at once. 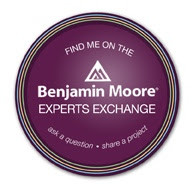 Whatever it is that you need, I find out via email most of the time but if you have a large project such as this one phone calls will be necessary. I’ll update you as the weeks progress for this client. The color phase is complete and we will be moving to the DECOR phase. This phase will include lighting, flooring, tile, cabinets and a whole lot more. Sound exciting? You bet it does! How Long Will It Take For Color to Go 100% Virtual? Can You Choose Ceiling Color on A Virtual Color Consultation? 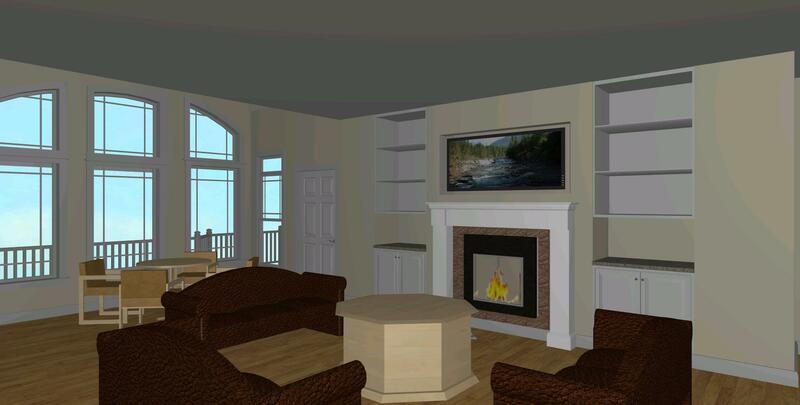 This entry was posted in Virtual Color Consultations and tagged floor plan, floor plans, virtual color. Bookmark the permalink.